In these modern times of flux and change, couples planning the big day often express a desire to hark back to the past. For many people a wedding embodies traditional values, timeless truths and endless love. 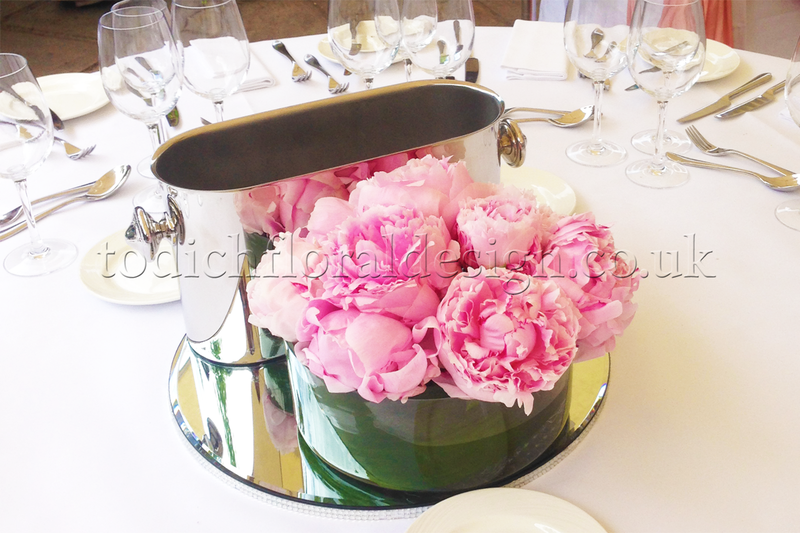 On such occasions, the consideration of flowers is key to creating a traditional day. Such blooms not only need to look beautiful, but also to carry a sense of history and significance. In this article we explore traditional flower choices for summer weddings – including their meaning, their varieties and other flowers that make their perfect partners. Roses are steeped in history and have long been loved around the world. The ancient Greeks associated roses with love and passion and for the Victorians they were an integral feature of their complex language of flowers. 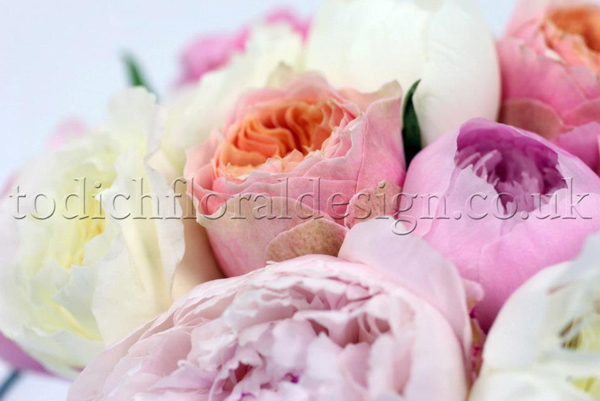 These blooms are by far the most popular to feature in wedding bouquets and decorations and it’s not hard to see why. All roses signify love, joy and beauty but different colours and numbers also have their own special meanings. While red symbolise passion and pink romance, white and ivory are ideal for traditional weddings as they represent innocence and fidelity. Roses are perfectly suited to round shaped bouquets, and can feature in neat and symmetrical or cascading arrangements. Embellishments such as feathers or pearls enhance the delicate beauty of these flowers, and they are also ideally featured with full blooms like peonies and hydrangeas. 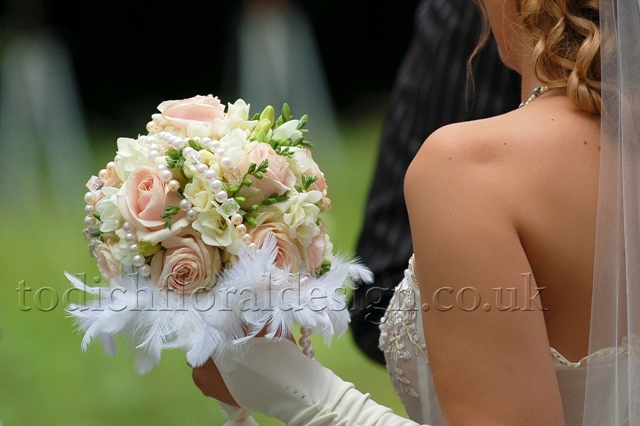 For a harmonious wedding flower look, roses work wonderfully as corsages and buttonholes. 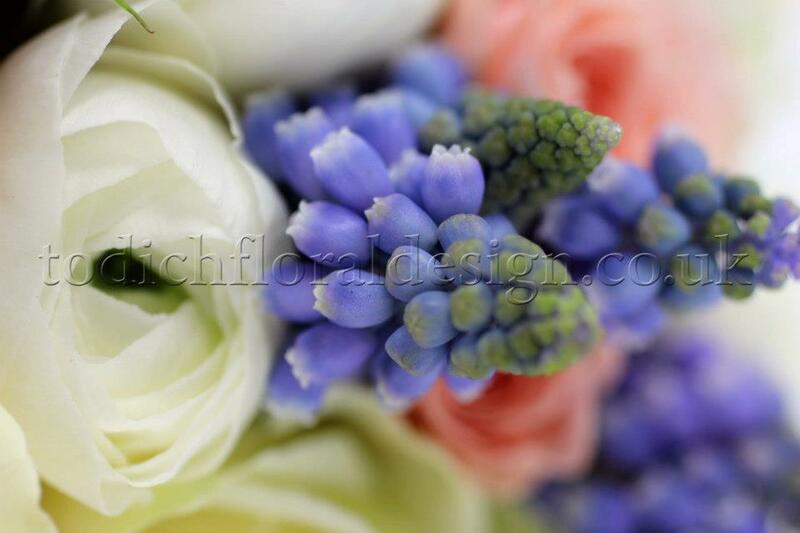 These can reflect the bride’s bouquet in colour and additional foliage. 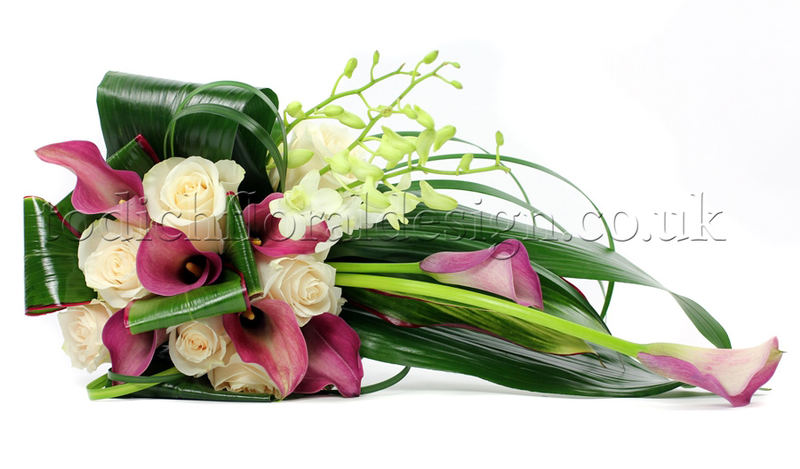 The lily is a beautiful, voluptuous flower that represents purity and femininity. The white lily is also a symbol for motherhood according to ancient Greek myth due to its association with the goddess Hera, so could be considered an auspicious sign to feature at a wedding. White lilies are classic blooms to play a part in wedding bouquets and decorations and work well with pastel shades of flowers like peonies and roses. Bright pink or yellow varieties take on the meaning of the colours of joy, happiness and love while orange or red varieties add a contemporary twist. 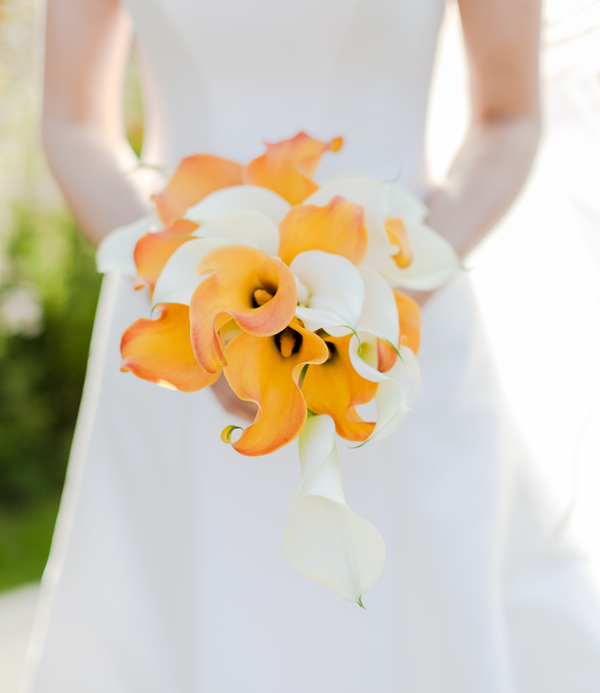 Calla lilies provide a more modern option but have nonetheless long been popular at weddings. These tropical blooms are native to South Africa and are in fact not true lilies but are members of the Araceae family, just like caladiums and philodendrons. 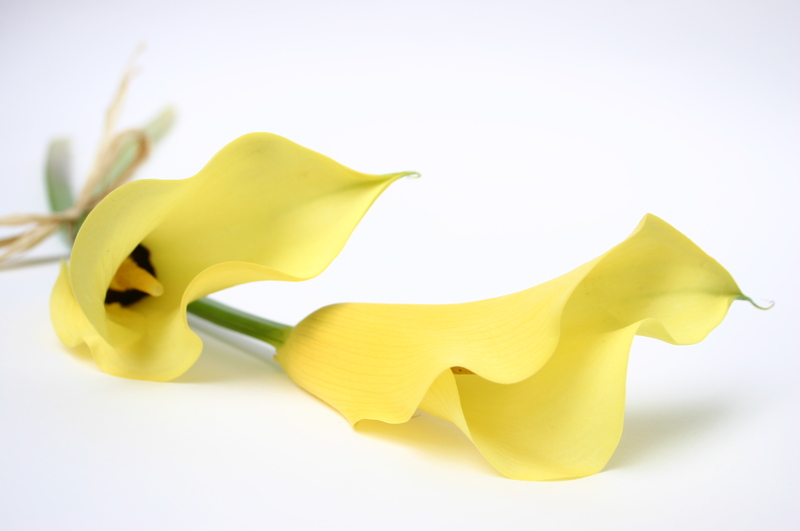 The calla lily’s name comes from the Greek word for beauty, but it’s aptness for a wedding flower goes beyond this. The flower has been associated with faith, purity and marital bliss since Victorian times – it is also the traditional flower for the sixth wedding anniversary. 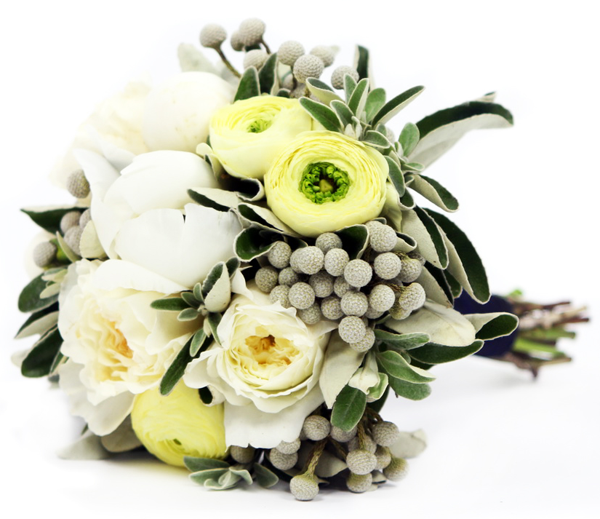 These wedding flowers are lightly fragranced and available in spring and summer. They’re available in many shades including bright yellow, deep red, peach, pale pink and of course white. Calla lilies make elegant wedding bouquets on their own and are also beautiful paired with roses or orchids in contrasting colours. With a name sprung from ancient Greek that means ‘water bearer’, these bountiful flowers epitomise grace and beauty. The blue variety, fitting considering their name, are the most popular, but these flowers bloom in many different shades. Bright pinks and purples symbolise love and riches, pale greens are serene and make beautiful companions to pastel flowers in bouquets, while white and pale pink flowers are ideal for a more classic look. With their full shape, hydrangeas are ideal for wedding table decorations as well as bouquets. Featured on their own, they create a fairy tale display that evokes tradition and beauty. They are also ideal as part of more complex arrangements. Create a timeless summer look with green hydrangeas and peach flowers like roses, or a bolder vision with purple and blue varieties. Long a popular flower in wedding arrangements, the versatile carnation is having a comeback and can often be seen playing the starring role in wedding bouquets and displays. This frilled and delicate bloom is native to the Mediterranean and carries a subtle fragrance. 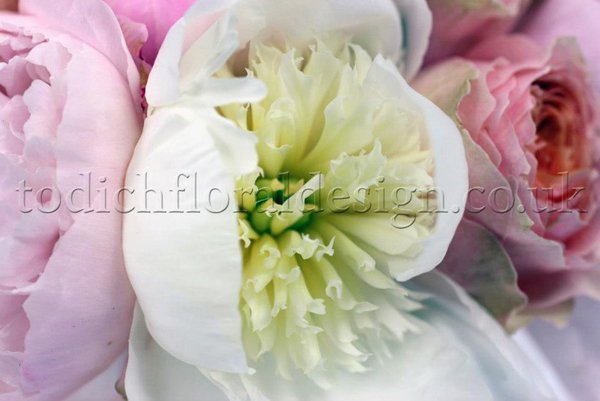 Originally only a pink flower, it’s now been developed in shades of white, yellow, red, purple and green. Different colours carry different meaning: red carnations represent love and devotion, while white varieties symbolise pure love and luck. This timeless flower can be reimagined in the modern age and really comes into it’s own with its versatility. Long strands of ivory carnations make the perfect backdrop to vows, while hot pink flowers can decorated wedding cakes or feature in full wedding bouquets featuring bright hued ranunculus and hydrangeas. A posy of white carnations embodies elegance just as well as more expensive favourites like roses or lilies, and yet still carries that timeless beauty that brides desire. 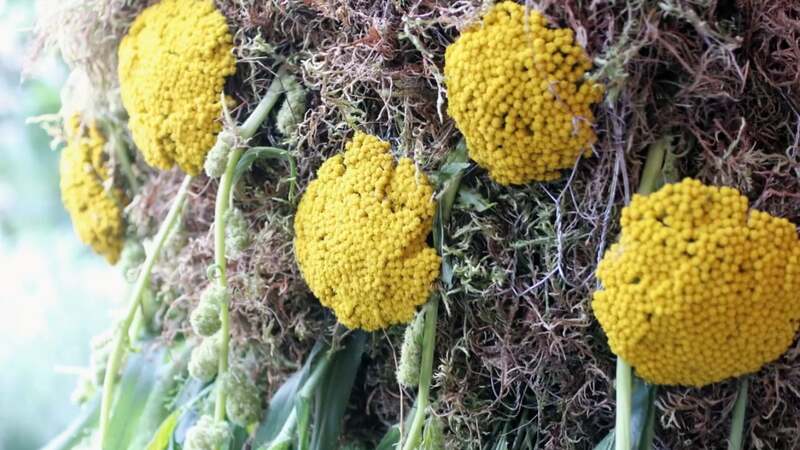 Surprising as it may seem, the original wedding flowers dating back as far as Roman times were fragrant herbs. Their scent was said to ward off evil spirits and bring good luck and fortune to the newlyweds. Lavender is a favourite flower for wedding bouquets – especially those with a Scottish theme and tradition to express – and their beautiful colour and mellow scent make them affordable and classic choices. 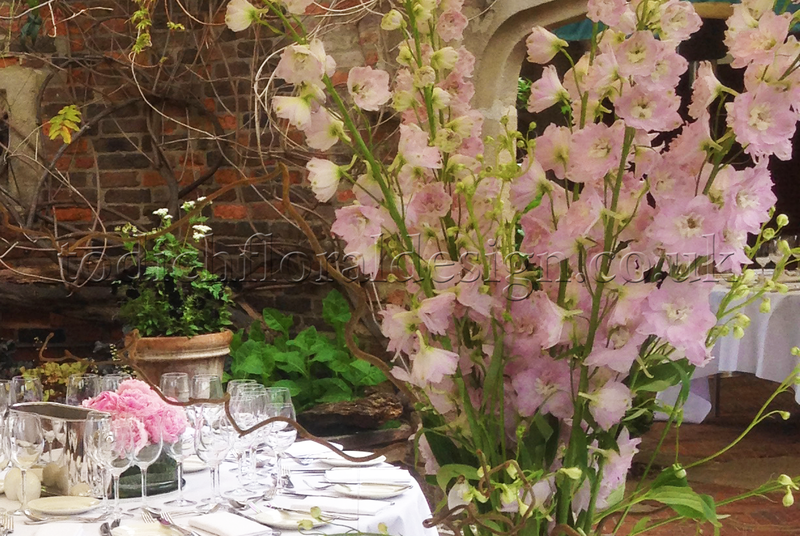 They are valued for their association with calmness, serenity and grace and are ideal for outdoor summer weddings. Sprigs of lavender work well for buttonholes and place settings when tied with twine or ribbons to napkins. A herb bouquet is ideal for the couple yearning for pastimes of folklore and nature; a perfect accompaniment to weddings with a rustic setting and theme. Foliage, heather, succulents and even vegetables like artichokes and kale can raise a herb arrangement to something truly sensational while still fulfilling the timeless style. Flowers can be added for texture and beauty: such as a white rose and rosemary arrangement, peonies with sage or wildflowers featuring chamomile daisies. Spices like cinnamon sticks and cloves will create an even fuller scent sensation. Just because the budget is tight, it doesn’t mean wedding flowers have to break the bank. There are plenty of options for couples looking to be cost-effective while still creating a beautiful, special day. 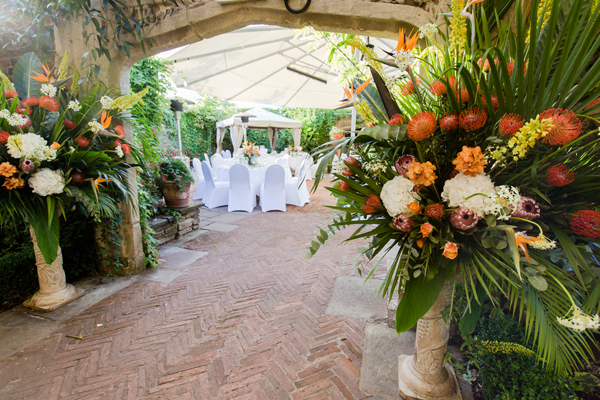 There are many options to cut the wedding flower cost in the summer – with the opportunity to be married outdoors in a garden that may well have an abundance of flowers to brighten the day. In-season flowers are more affordable when looking for budget wedding flowers, or the wedding party could grow their own, opt for foliage arrangements or choose an alternative to flowers altogether. There’s no chance that wedding flowers on a budget can’t be as lovely and special as any others. Go for green. As an alternative to a floral bridal bouquet, consider having a beautiful bouquet of foliage. This fresh look is subtle and elegant, a wonderful complement to a white dress and importantly is a more affordable option than traditional wedding flowers. Succulents are very fashionable and come in a range of textures, colours and shapes – many looking much like flowers themselves. 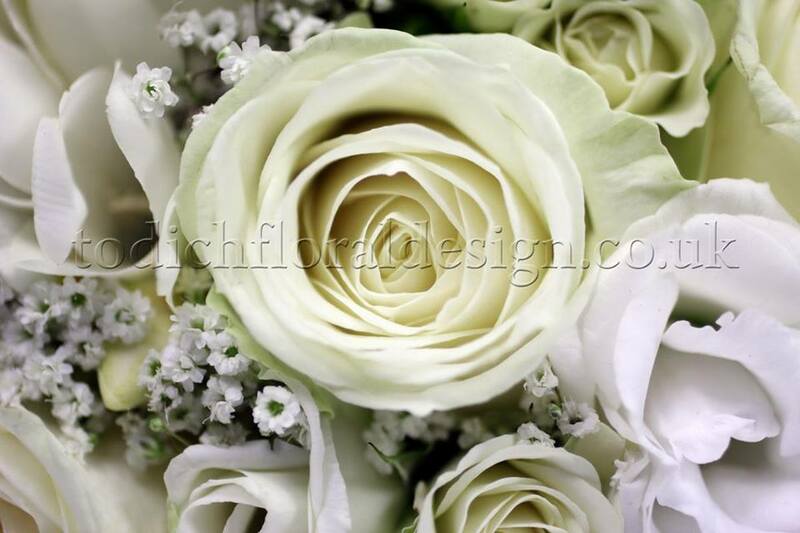 They can make beautiful bride and bridesmaids flowers on their own or can be featured with other greenery or flowers. 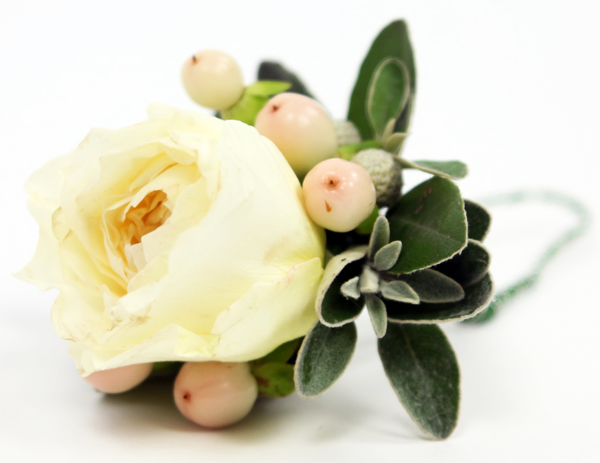 Ivy is ideal for winter weddings, while thistles and heather are perfect for Scottish occasions. Silvery eucalyptus or delicate, fringed ferns are another unique choice for a foliage focused arrangement. Vegetables like artichokes and kale flowers are beautiful alternatives to flowers, very on-trend and perfect for summer wedding bouquets. Consider traditional fragrant herbs (thought to keep bad spirits away) like rosemary, sage and thyme for a simple bouquet – and these can be grown in anyone’s garden before the big day: another great way to save some pennies. Instead of wedding flower decorations for the tables, consider creating rustic looks with moss, bark, pebbles and other findings from the forest. This is particularly good for an outdoor wedding. 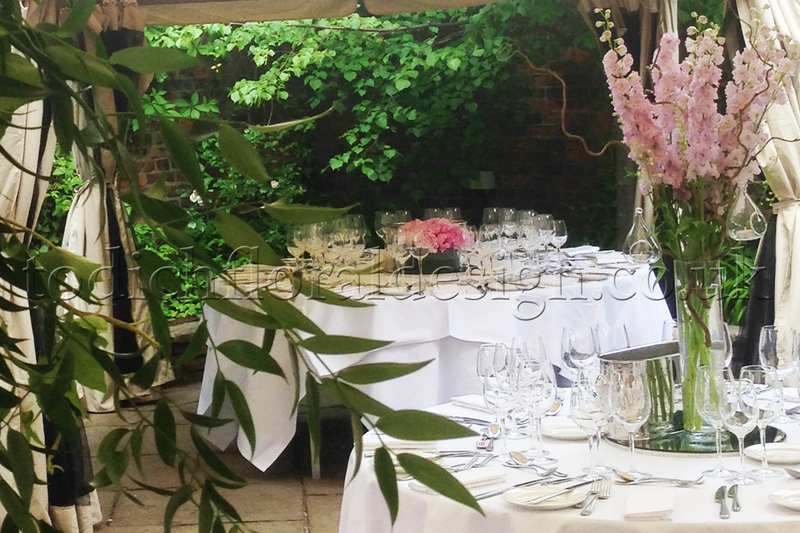 Of course, if the venue is a garden, field or woodland, nature provides the flowers and greenery itself! Herbs can be used again for table settings and tied to napkins and winding centrepieces can be made out of leaves and other foliage to drape across the centre of the table. Fern leaves can be displayed in mismatched glass vases to add interesting shapes and freshness to the design. Succulents are great additions to wedding flower table designs, or use potted ones as a wedding favour and place setting. Grow your own. An alternative to buying flowers from wedding florists is to grow your own wedding flowers. As long as you get the timings right you can grow foliage and herbs for your bouquets and table displays, as well as flowers. English garden flowers like cornflowers, daisies, roses and foxgloves all bloom in summer and are perfect for creating rustic looks. It’s charming to know that the flowers have been grown by the wedding party, and adds a very personal touch to the proceedings! 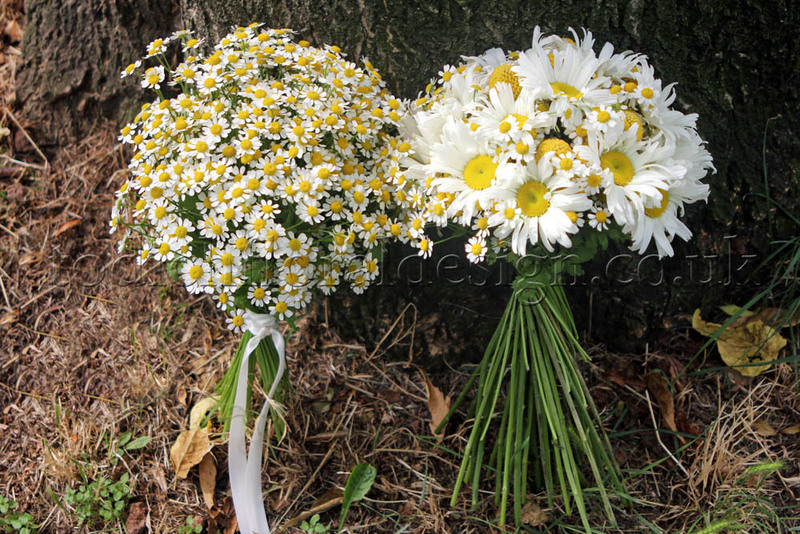 Some may wish to grow wedding flowers as their wedding gift. Pick flowers two days before the wedding, strip off any greenery below water level and place in water in a cool dark place to keep them fresh before the ceremony. Flower alternatives. Instead of wedding flower bouquets, there are lots of floral alternatives that are more affordable, more unique and give the chance for the happy couple’s personalities to really shine. Large paper flowers are a striking choice – and the bridesmaids can all have different colours. Bridal wedding bouquets can be made of many different beautiful items including feathers (such as peacock or ostrich), gems and jewels, even something sweet like candy canes can be used (perfect for a fairground themed wedding!). Silk wedding flowers are another choice to go for – and these will last forever, creating wonderful memories of the special day. Similarly, the ceremony and reception doesn’t have to be decorated with flowers. Fairy lights and bunting will look beautiful for both, and candles on tables can be a great alternative to flowers. These could be tea lights for a more rustic occasion, floating candles or elegant church candles displayed in lanterns. Branches decorated with jewels and lights are a great wedding flower alternative or go natural with natural made of wood, bark and moss. Alternatively, a sea theme could use gathered shells, pebbles and sand to create lovely decorations. Choose cheaper flowers. Instead of expensive blooms like roses and peonies, go for none the less lovely wedding flowers like carnations, chyrsanthemums and gerbera daisies. Both of these flowers are available in a range of colours and can be made into delightful bouquets and table decorations on their own or with additional foliage. Baby’s breath is very affordable and very popular at the moment for brides flowers and wedding table displays. It’s romantic and a lovely neutral colour to suit all decors and themes. Growing your own flowers is another way to ensure summer flowers are in season, and also doesn’t cost the earth. It’s also important to ensure flowers are in season to create cheaper bouquets and arrangements that don’t have to be imported. Investigate which flowers are in season in the month of the wedding and ask your florist to create arrangements made of these. Keep it simple. Single bloom bouquets and arrangements will always be more affordable than more complicate and elaborate looks. Many flowers look stunning on their own, and in single colours, such as roses, lilies and tulips. 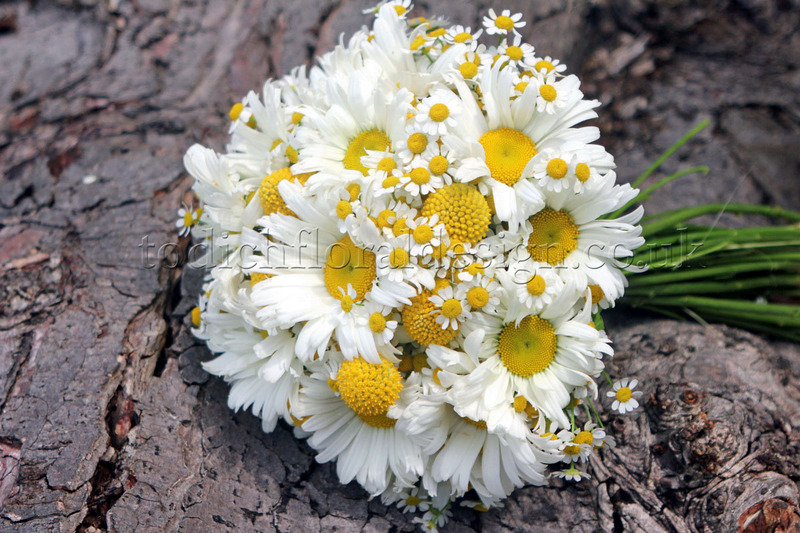 A bouquets of daises is perfect for a rustic, laid-back wedding (especially an outdoor do) while sunflowers are readily available in summertime and create glorious, colourful but inexpensive wedding bouquets and centrepieces. Even if the bride’s bouquet is more show-stopping, bridesmaids posies could be made up of just one of the flowers to create smaller, delicate designs. For a Scottish wedding, a spray of heather is traditional and charming while a bouquet of lavender is a lovely look for any wedding that looks to keep things simple, affordable and classic. Whether you’re after Boho Chic, a vintage affair, or a traditional garden theme for your wedding, the choice of summer flowers on offer, couldn’t be more exciting. Our seasonal flower guide is packed with plenty of floral inspiration, with wedding flower ideas to help you plan out beautiful wedding floral designs for your big day. Pastels are on trend this summer, elegant, rich in colour and purely whimsical, pastel coloured flowers add an element of enchantment to wedding flower arrangements. 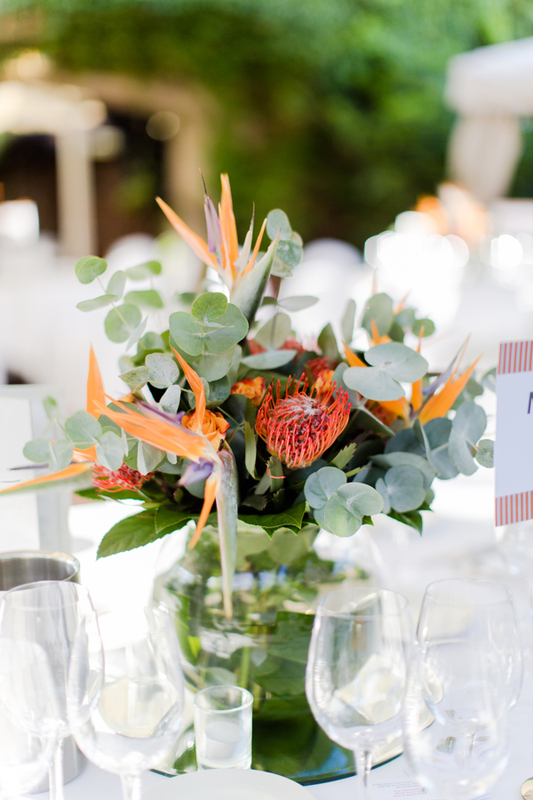 Summer is a popular time of year for weddings and if you’re planning a summer wedding, you’ll be excited to know there’s plenty of spectacular wedding flowers to choose from. Flowers remain the number one way to decorate the wedding venues, their rich colours and heavenly scent instantly lift interiors, brightening and adding warmth to the surrounding space. Fresh flowers will completely transform and rejuvenate wedding receptions with exquisite wedding centrepieces to show stopping flower chandeliers. Some of our favourite summer flowers include pastel shades of Cafe au la Daliahs, Freesia, Clematis, Roses, Veronica, cow parsley and blushing bride Protea. 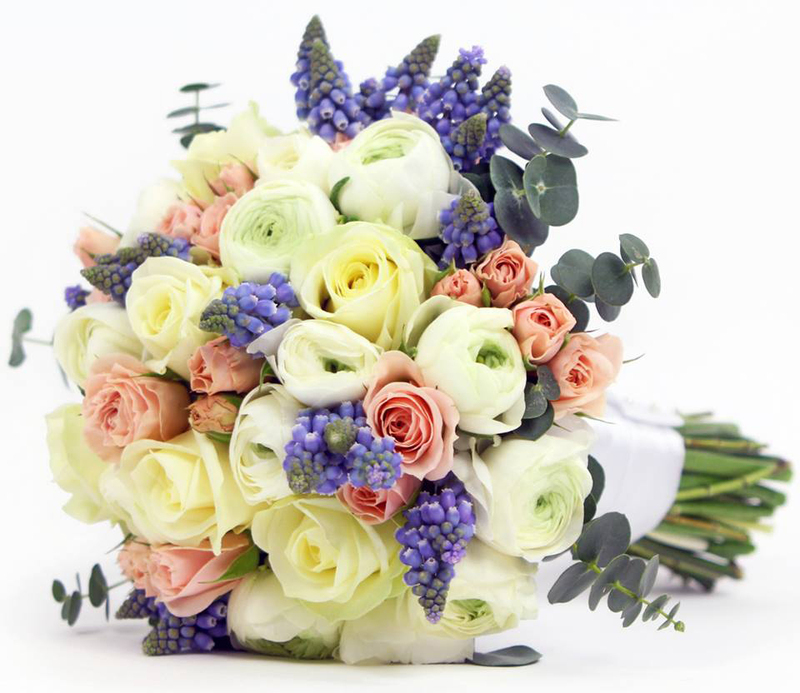 Whether you’re after pastels that wow, something simplistic and beautiful or looking for traditional classics, add a touch of summer to your special day with our beautiful range of designer bridal bouquets. Boho Chic ~ The Boho Bride ~ Flower Crowns. Whether its a flower crown, a single flower or flower buds worked into loose plaited curls It’s no secret that, the ultimate Bohemian at heart, is the bride has flowers in her hair. What's great about this is that you can keep it subtle and elegant, incorporating cow parsley or lavender and foliage loosely together, or go bold with flowers such as peach peonies, pale yellow, soft pink or white roses, woven into a large crown with contrasting foliage or twigs. Waterfall Bouquets. Perfect for continuing a Boho theme are cascading flowers, a big trend at the moment, cascading bridal bouquets are back with full force and become increasingly popular. From rustic arrangements of overflowing wildflowers to magnificent waterfall orchids and seasonal foliage, cascading bouquets work wonders, adding plenty of colour, texture, drama, glamour and romance to your wedding day. Peony. A wedding bouquet of beautiful full pale pink peonies, white peonies, classic white roses and lashings of trailing lush summer foliage, adds drama, enchantment, sophistication and plenty of romance to bridal flowers. Roses. Wow with a bouquet of classic white roses, peach roses, white calla lilies, mixed orange and yellow calla lilies with trailing branches of delicate white Astilbe. 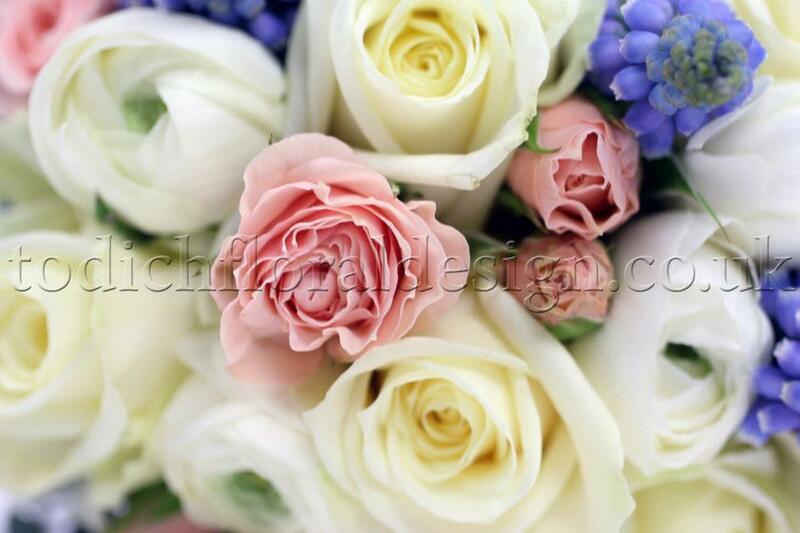 Roses make great bridal wedding bouquets and add elegance and romance to arrangements. 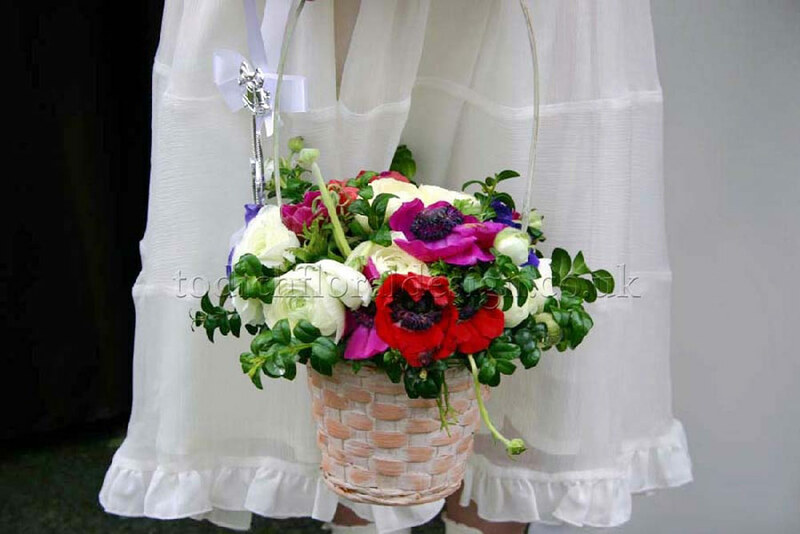 For bridesmaids bouquets, choose smaller quantities of the same flowers. Daliahs. Dahlias are one of the most popular wedding flowers, a highlight of the summer garden, dahlias large bushy blooms begin to emerge from mid summer to autumn. Create exquisite bridal bouquets with a bouquet of large peach dahlias, pale pink roses, white roses and trailing branches of pale peach Astilbe. Vintage Dreams. If its a retro vintage wedding theme you’re after, reach for an authentic feel with vintage flowers. For a blend of modern and vintage, opt for bridal wedding flowers which include, clematis, roses and lamb’s-ear foliage. Arrangements which generally include roses, clematis, and lush forest green foliage, add texture, working as the perfect balance, for a rustic, elegant feel to bridal wedding bouquets. 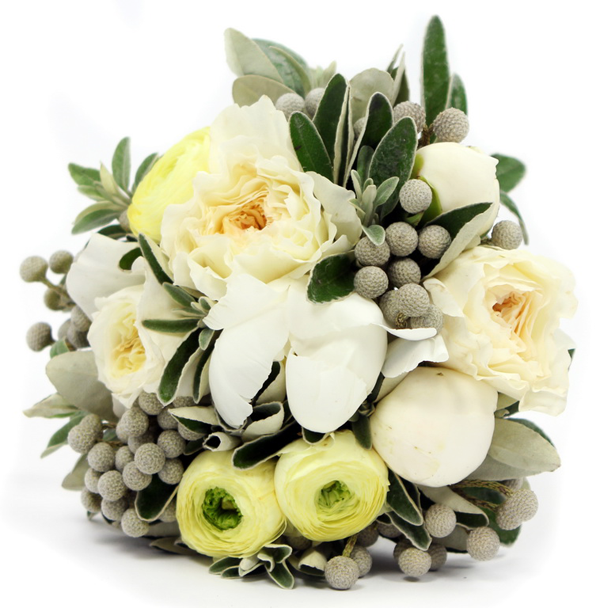 For an added vintage feel adorn flower bouquets with crystals or pearls. 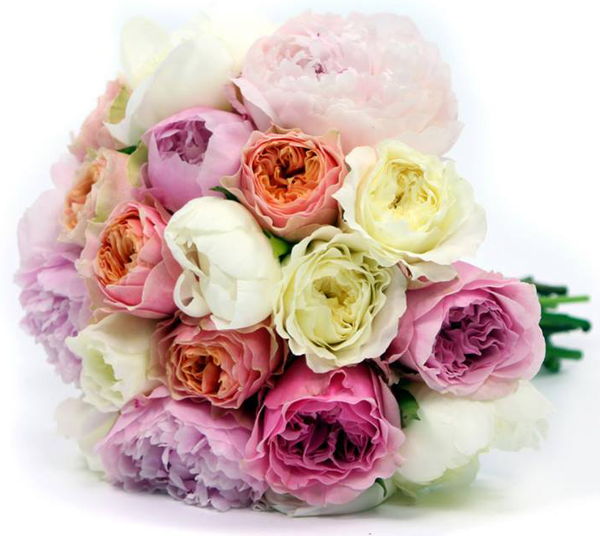 Rich sumptuous pastel shades of peonies, dahlias, roses, blossom and hydrangea look spectacular in coral, pale orange, pale yellow, soft pink or purple. Each work beautifully to form exquisite bridal bouquets, wedding centrepieces or table flowers housed in glass jam jars or vases. Ensure to add lashings of summer foliage for a wild vintage flair. Succulence. For a bouquet with a difference, how about arrangements of blush roses, white peonies, pale pink peonies, white peonies, baby’s breath and succulents. Succulence is increasing in popularity, its thick, swollen stems, add texture and character to wedding flower arrangements. Gypsophilia. Gypsophila also known as a lady’s breath has narrow green leaves with large clusters of beautiful white or pale pink double flowers which begin to blossom in summer. 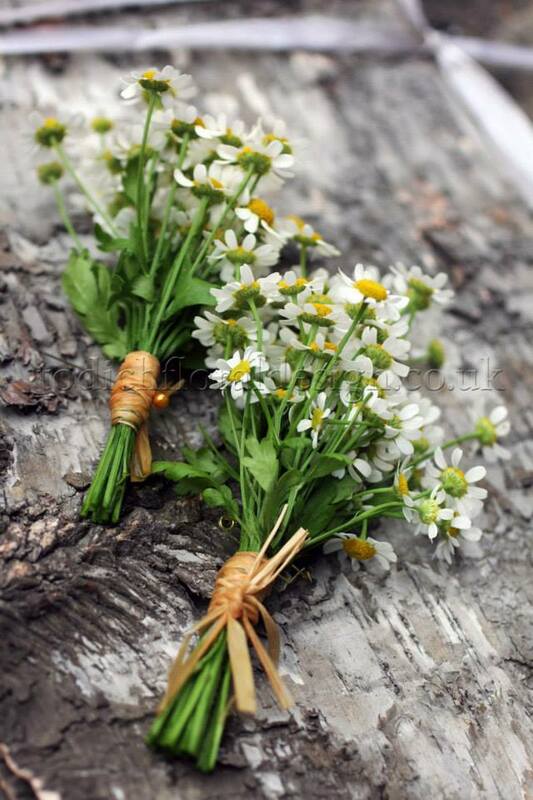 Gypsophila make beautiful wedding flowers as their delicate form add a soft vintage flair to bridal bouquets. Gypsophila look stunning on their own Handtied with silk ribbons, alternatively match with large pale orange roses, soft pink roses, pink dahlias and foliage. Colour Celebration. For a splash of colour, mix vivid colours with pastel shades. An arrangements of bright pink and orange garden roses matched with pale orange dahlias, purple, lavender, wildflowers and lush foliage make an eye catching vintage bridal bouquet. English Classics. If your looking to keep it traditonal and sophisticated, arrangements of classic white wedding flowers and pastel shades will do just that. Here are some ideas for traditional bridal bouquets. White Wedding. Put a modern twist on the traditional bouquet with an arrangement of stunning white scented gardenias, delicate white Stephanotis, lilies of the valley, gages white roses and white peonies create a magnificent and truly elegant bridal. Variations of white flowers add a contemporary twist to a traditional classic. White Waterfall. 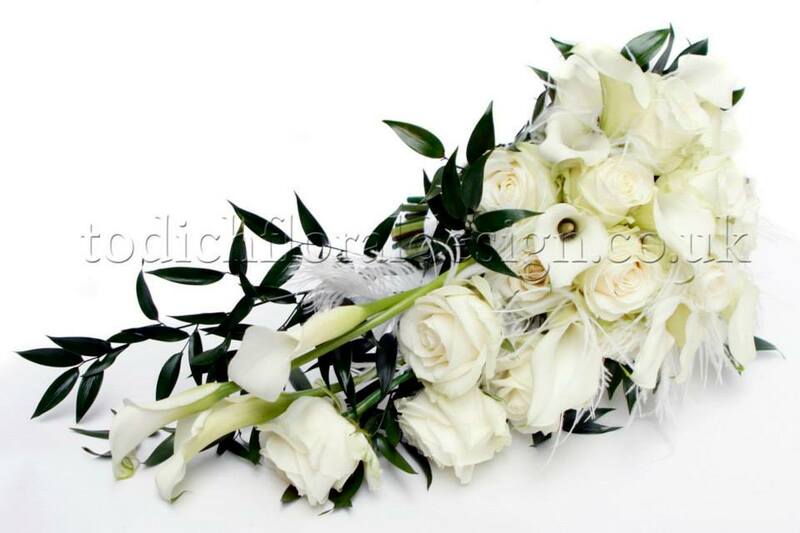 If you're looking to create a statement, how about an all white waterfall bouquet? Create an exquisite all white cascade, made from polo roses, sweet peas, ranunculus and delicate small lilies of the valley for a spectacular all white affair. Pink Bouquet. A round bouquet made from large fragrant pink garden roses, volumes pale pink peonies accented with leaves make spectacular bridal wedding bouquets, complete the look with hand tied satin ribbon. Rose Devine. 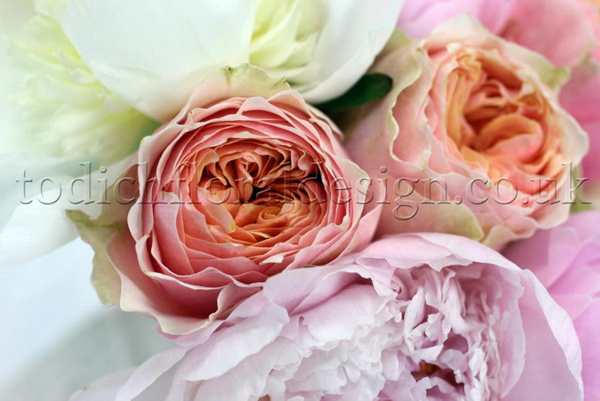 Garden roses make exquisite classic bridal bouquets and add elegance and romance to any arrangement. Large garden roses arranged in an array of pastel shades, such as soft pink and white create the ultimate traditional bridal bouquet.